Fall preview time! Here are a few more pieces that have caught my eye lately. Don’t you love these colors? Soft Blazer | My sister-in-law took me to Aritzia when we visited Seattle. HELLO NEW FAVORITE STORE. Why don’t we have one in Austin? Tote | If you follow me on Instagram, you saw my overly enthusiastic post about this tote and how it’s the doppleganger for the Madewell Transport Tote. It looks just like the real thing — but it’s $48! Berry Moto Skirt | I haven’t decided whether or not to buy this … but I love the moto style + color. What do you think? Ankle Booties | These were my second purchase for my capsule wardrobe (right after my Madewell high-top Vans). Boom — statement piece! Berry Sweater | I actually bought this sweater last year. It was the piece that inspired me to go with red + maroon + berry as my accent colors this year. Black Heels | So I actually decided not to buy the heeled booties I posted about last time — I got these instead. Less expensive + they’re much more me. Love all your choices Caroline! I think you should get the berry moto skirt. I especially love that berry sweater. Since you already have it, could you tell me if it runs true to size or is it oversized? Thanks! I bought a similar moto skirt in black from Madewell and LOVE it. So chic. I am loving the berry colours you’re putting into your fall wardrobe. Can’t wait to see more sneak peeks and the full capsule! I love berry shades for autumn and winter – so beautiful and cosy. Right now I’m working on putting together a capsule wardrobe, but one that will work while I’m losing weight, eek. Hopefully it all works out! Love the glimpses of your fall wardrobe. Those heels are really awesome, so much remix potential. I bought the Nordstrom reversible bag a few weeks ago and love it too! Could you please explaine how you decide what’s a statement piece??! I’m having trouble figuring out that kind of stuff. I was at the store yesterday trying to decide between leopard print or burgundy for ankle booties. My capsule plans helped me make the tough call. ; ) I went with burgundy. I love the skirt too, great color! I think it would look good with your black leather Zara jacket. The berry moto skirt is my favorite out of all the items you showed! LOVE the colors and style! Wish I could pull it off here in Minnesota, but there just aren’t enough weather-appropriate days to make it worth it. Loved your picks! Aritzia is a Canadian store but they’re branching out into the states, hoping they open one up near you! First, I get so excited every time you post a new capsule sneak peek!! Second, that bag is lovely. Super versatile, but very ‘fall’. Can’t wait to see the rest!! Great picks! Love the color and details of the skirt. 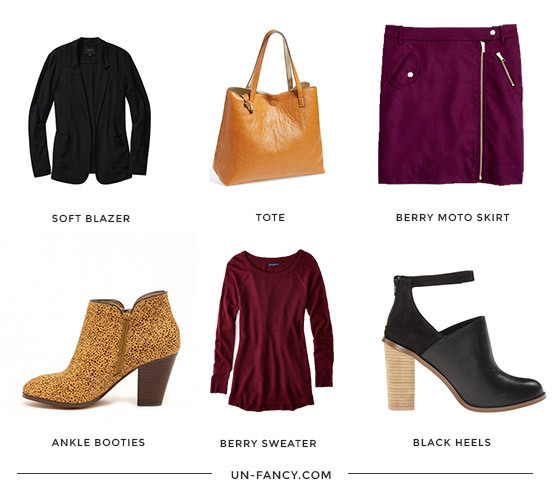 Hadn’t heard of Aritzia before, but love their offerings – what a find! Ha, Aritzia has been around up here for a long time, but I’ve never been in because it’s really expensive (apparently) and I always see teenagers walking around with the bags so I figured it wouldn’t apply to me. Maybe I’ll check it out next time. The booties and black heels are so cute! I love the color palette you’ve got going on! I have never commented but have been coming over for several weeks after seeing a link at YLF to your blog. And I am happy to see more colors for fall. Neutrals certainly are very easy to mix and match but I find select color lends a certain something to a wardrobe. Brilliant! Best website I’ve seen for paring down a wardrobe and building personal style. Thanks for the tip on Aritizia – I’ve seen it but wasn’t curious enough to go inside – couldn’t figure out the target market, but will definitely check it out next time. IIRC, there was a huge store in downtown Vancouver as well. Love the skirt – I hope you get it! I agree with commenters above – it would look great with your moto jacket, a fun, cozy sweater and ankle boots or the blazer from Artizia. Thanks for the fun sneak peaks! Yes, Aritzia is one of my favorites. I shop Aritzia.com often and the customer service is fabulous. Very comparable to J.Crew & Madewell. Just found this blog via The Small Things and am really excited. It’s time for a total wardrobe update and I think the capsule idea is going to really help me buy the right pieces to make it all work. Thanks! YAY! love the fall look. Aritizia is Vancouver’s best kept secret. It’s from here and we LOVE it! So happy you found it! Love this blog, can’t wait for all your fall looks!